Irrigation Equipment (Non-Toro) » Shower Nozzle » IR-DA1000 - Surf the Turf! 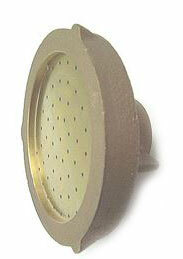 As the name applies, this Classic All Brass Shower Nozzle is ideal for putting out a high volume of water very gently. Ideal for spot syringing greens, tees and fairways. Also, useful for watering beds. 3/4" Female Hose Threads. 1" Female Hose Threads Adapters are available.